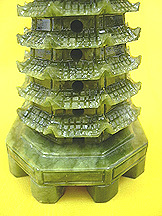 For crystal lovers and antique collectors, this majestic 9-tiers Wen Chang Pagoda hand-carved from genuine jade will be the ideal pagoda for you. In Feng Shui, nine represents "fullness" or "completeness" which guaranteed fulfillment of any aspiration you desire. A wulou sits on top of the pagoda to cure malevolent energy and illnesses. Both powerful symbols of feng shui, the wulou and pagoda when come together makes it even a more perfect protector and space energizer. And jade is the official gem for china's ancient monarchs and considered to be more precious than diamond. Today, it is popular among the high class and is thought to be a magic gem providing protection, improve relationship by strengthening mutual goals, harvest unity and provide success during hard times. Jade embodies perfection, immortality, and is a symbol of love, fidelity, virtue, generosity, wealth and nobility.This pagoda is guaranteed to enhance your thinking clarity and capability. It purifies and transmutes all forms of negativities in your space and carries both healing and enhancing properties. 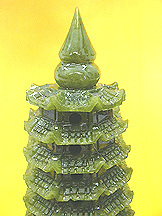 This pagoda brings protection, scholastic luck, fame luck and advancement in career. This pagoda brings protection for those who are working, managing and leading a company, scholastic luck to those who are pursuing their studies and preparing for important examinations to enter universities (equivalent to ancient imperial examinations for court officials). Besides they also bring fame luck and advancement in career. In Hong Kong, Taiwan, Singapore and Southeast Asia, Feng Shui grandmasters build such pagodas to improve the energy of the surrounding and bring good fortune to the country. This precious pagoda with esthetic value would also be a very suitable gift idea for your children, loved ones or peers who are pursuing their studies to improve their examination results when placed in the Northeast according to 8 aspirations or where flying star#4 resides at home. The green jade pagoda is the most authentic and effective way to activate wood literary/romance star#4 for Flying Stars Enthusiasts. Wen Chang Pagoda is another powerful tool used by Feng Shui masters besides windchime, bagua, coins and wu lou. Its name is derived from the Wen Chang star, which is one of the Flying Stars in the #4 Green. This Wen Chang star dominates over the fate of students and controls the wealth and success in studies. Wen Chang Pagoda bring literary luck to those who are pursuing their studies and preparing to enter universities (equivalent of ancient imperial examinations for court officials). Besides they also bring fame luck and advancement in career. It is also great to make one's mind more vigilant, agile, intelligent and improving ones literacy at work. It is also potent to ward off bad energy and killing forces in our surroundings. For health, we can also used it to ward off evil spirits and illnesses. The pagoda can trapped evil spirits for rehabilitation purposes. On the other hand, jade is believed in feng shui to be the link between man and the heaven and is called the "stone of heaven" during ancient times. Jade gives impression of delicate gracefulness, elegance and exquisiteness. Widely used in esteemed arts and crafts from 18th century till today, jade embodies perfection, immortality, and is a symbol of love, fidelity, virtue, generosity, wealth and nobility. Jade promotes good health, protection against losses and good fortune.